To access Purchase Orders from the menu bar of the main TeleTracker Online screen, click Transactions, then Purchase Orders. To create a new Purchase Order, click on the New button located on the toolbar. To open an existing Purchase Order, select the Transaction from the Purchase Order list and click the Open button. icon on the TeleTracker Online toolbar to create a new Purchase Order. IMPORTANT: When creating a new Purchase Order, you must be logged into the location that the products will be received IN to !!! 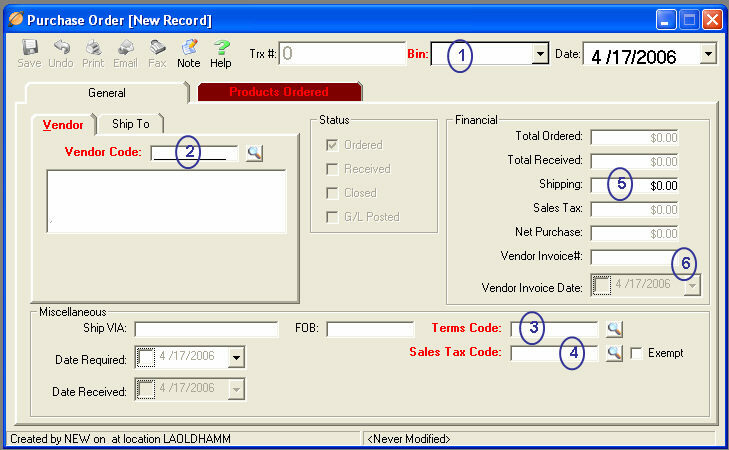 All items marked in RED are required fields and must be populated before the Purchase Order can be saved. (1) Select the appropriate Bin in which you wish to place the items on the Purchase Order. (2) Enter the Vendor Code. To perform a lookup of available Vendors, click on the lookup button to the right of the Vendor Code field. You may search by any of the available columns. Highlight your choice and either double-click or hit the <Enter> key. Once your selection has been made, TeleTracker Online will automatically populate the Vendor Code field and the Vendor’s corresponding data into the information box. (3) Select the appropriate Terms Code for this Purchase Order and Vendor. To perform a lookup of available Term Codes, click on the lookup button to the right of the Terms Code field. Highlight your choice and either double-click or hit the Enter key. (4) Select the appropriate Sales Tax Code for this Purchase Order. To perform a lookup of available Sales Tax Codes, click on the lookup button to the right of the Sales Tax Code field. Highlight your choice and either double-click or hit the Enter key. If Sales Tax does not apply to the Vendor, simply click on the Exempt checkbox to the right of the Sales Tax Code field. (5) Enter any shipping costs into the Shipping field under the Financial section. (6) Enter the Vendor Invoice # and select a Vendor Invoice Date only after the Purchase Order has been received and all changes, including product costs and shipping, have been made. (7) Enter the Product Code you wish to order. You may enter the Product Code either by scanning the item with a barcode gun, typing it in manually, or performing a lookup and choosing from existing products. To perform a lookup, click on the lookup button in the Product Code field. Highlight your choice and either double-click or hit the Enter key. 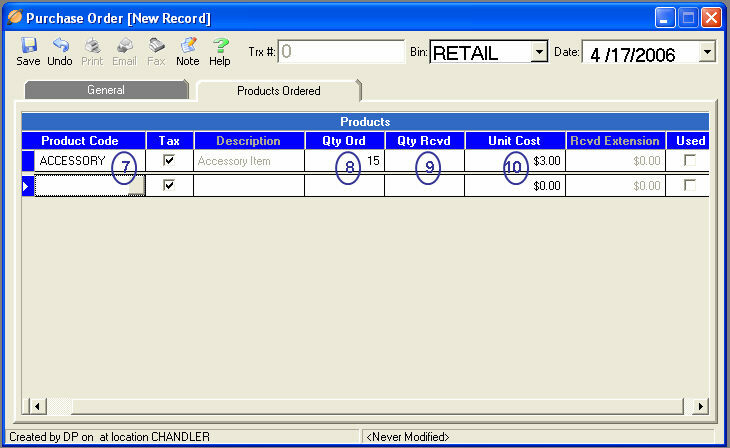 TeleTracker Online will automatically populate the Product’s corresponding data as defined in the Product’s Master File. If you need to create a new product for the Purchase Order, you may do so from the Product Lookup screen. After the product has been created and saved, TeleTracker Online will automatically populate the new Product’s corresponding data into the Purchase Order. (8) Enter the Qty Ord (Quantity Ordered) of the product being ordered. TeleTracker Online will automatically default the quantity field to one (1). However, you may change the quantity by either using the scrollbar on the right-hand side of the Qty Ord field or by entering the desired quantity in the Qty Ord field. (9) In most cases, you will 'receive' your ordered products into TeleTracker Online when they physically arrive to your store or warehouse. For this case, leave the Qty Rcvd blank until the products arrive. Complete the rest of the Purchase Order and save accordingly. See the Receiving section below for instructions on receiving your products. TeleTracker Online will allow you to automatically receive the products you order when you create your purchase order. To do this, enter the Qty Recvd (Quantity Received) amount and save the Purchase Order. (10) TeleTracker Online automatically populates the Unit Cost field with the last cost received for the respective product and vendor. This field can be edited until the Vendor Invoice # and Vendor Invoice Date is entered and the received Purchase Order has been saved.